Of course, we also have life jackets and other safety equipment on board. Have you ever wondered what it is like to breathe underwater? If you are not a certified diver yet, you can choose to do an introduction dive (1.5 day) or to take a diving course (3 or 4 days). We both offer Padi’s Discover Scuba Diving experience and SSI’s Try Scuba Diving Experience. They are a great for anyone wanting to experience diving for the first time! The first day you come for a short theory session and you jump in the pool with an instructor to learn basic underwater skills (total 2-2.5 hours). The next day you can already dive in the ocean under direct supervision of a professional dive instructor – a moment to never forget! Of course you can decide after your first dive on the boat if you want to make a second dive or if you want to go snorkeling, but be careful: once you are hooked on scuba diving, you won’t want to get out of the water. Padi and SSI are both dive agencies that combine fun, safety and high standards into an amazing underwater experience. Their introduction programs won’t turn you into a certified diver, but your experience is being registered online and can count if you decide to take the full course. If you choose to do your first diving experience with SSI, you will receive a nice card straight away as a proof of your experience! Maximum diving depth: 12 meters. Not 10 years old yet ? ScubaKids Bubblemaker is a great way to introduce children to the exciting underwater world. With this specially designed program kids as young as eight years old can explore diving in a fun and safe way. Our SCUBAFISH team consists of experienced, multilingual dive professionals, all excited to share their passion for diving and the underwater world with your kids in the pool. We have the knowledge, expertise and facilities to ensure your little ones will have lots of fun and an experience to remember. Get the whole family involved and give your kids the chance to discover the joys of blowing bubbles underwater! Become a diver and do a Scuba Diver course! If you want to learn to dive but have limited time, this course will be great for you! During the two-day course you are accompanied by a PADI instructor. Day 1: Theory to gain a basic understanding of diving & pool session to master some beginner diving skills. After your certification you are allowed to dive to a depth of maximum 12 meters with a dive professional. Your certification is being recognized all around the world ! This exciting three to four day course is the most popular entry level dive course in the world! The course consists of a theoretical part and a practical part (in the pool and in the ocean). Besides doing skills, there will be plenty of time to explore the colorful reefs. All our courses take place at Mnemba atoll, so even during your training dives you will see the best that Zanzibar has to offer underwater. After completion of the course you will receive your certification and you are allowed to dive to maximum 18 meters. You can choose yourself how you want to complete the theoretical part of the course. 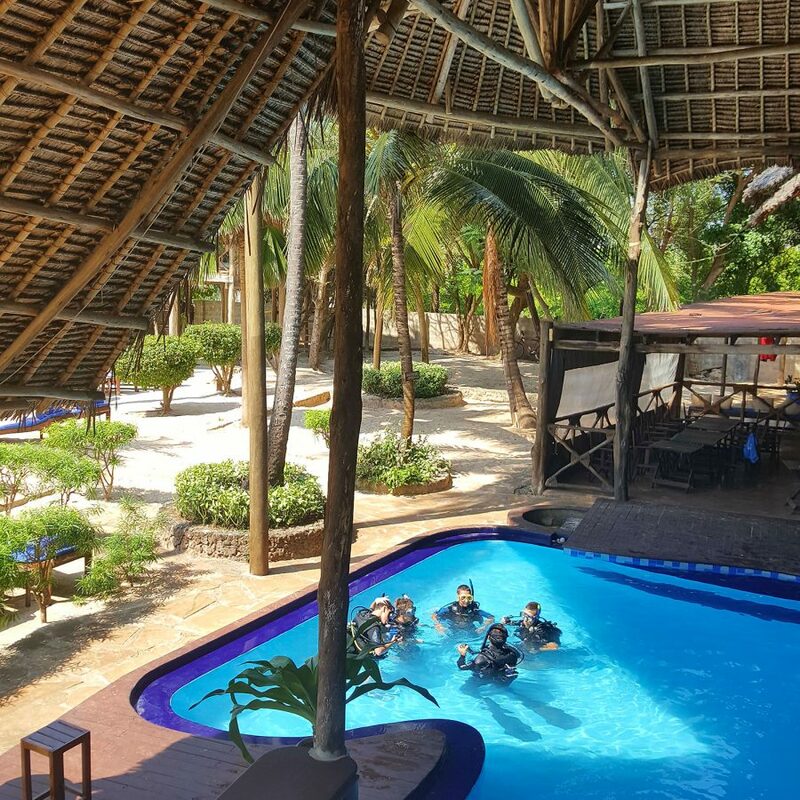 You can complete your theory in Zanzibar at our dive center or you can choose to do the theory at home, prior to your holiday. Padi will send you a temporary certification card by e-mail, and within a few week you will receive a physical card at your home address. If you choose SSI, you will receive your certification card right away. But there is more… SSI Open Water Divers receive a brand new mask and snorkel to take home to assure you will keep making bubbles ! Open water course does not fit your schedule? If this is the case, complete your theory at home through the website of SSI or with the PADI Open Water Course E-learning program. We understand your holiday time is precious and it’s not necessary to spend time in a classroom if you don’t want to. SSI and Padi offer you the opportunity to learn anytime, anywhere. When you arrive in Zanzibar, you can immediately jump in the pool and start diving. After completion of the course you will receive your certification and you are allowed to dive to maximum 18 meters. If you plan to do your theory at the dive center you can choose to use the special program on the table or study in a classroom setting. Afterwards you will be doing the confined water dives in the swimming pool to learn all the basic skills in a safe and comfortable way. The last 2 days you will do four open water dives to put in practice what you have learned.